The following is a press release from Sen. Elizabeth Warren’s office. She is one of two elected senators who represent the Commonwealth of Massachusetts in Washington Dc. She is a Democrat. 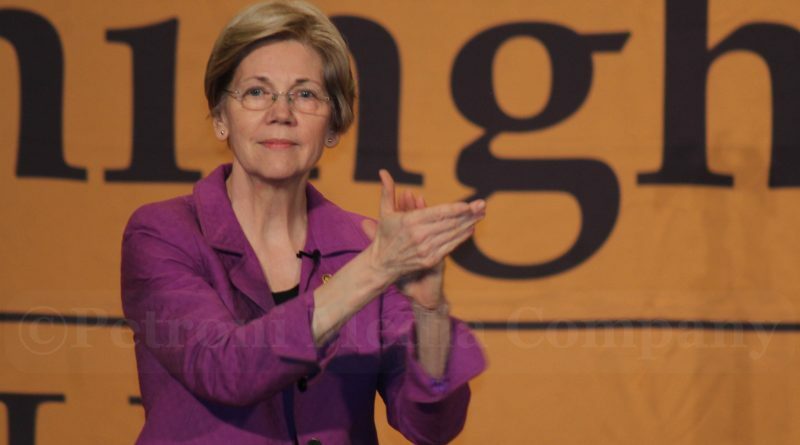 WASHINGTON DC – Today, March 13, Senator Elizabeth Warren (D-Mass.) and Representative Joe Courtney (D-Conn.) reintroduced the bicameral Bank on Students Emergency Loan Refinancing Act, a bill that would allow undergraduate borrowers repaying public or private loans to refinance those loans to an interest rate of 3.76 percent. The bill would also allow graduate and parent borrowers to refinance to competitive rates, reducing monthly payments and helping borrowers repay loans sooner. The Bank on Students Emergency Loan Refinancing Act is a continuation of Senator Warren and Representative Courtney’s efforts to help families and students afford the costs of higher education and to reduce the burden of student loan debt. The Bank on Students Emergency Loan Refinancing Act would allow borrowers with existing public or private student loans to refinance those loans to a 3.76 percent annual interest rate – the same lower rate that was offered in the 2016-2017 school year. Graduate school loans could be refinanced to 5.41 percent, and parent loans for a child’s education to 6.41 percent. According to estimates from the Department of Education, about 25 million borrowers would be likely to refinance under this legislation, and borrowers would receive an average savings of $2,000 over the life of their loan. The bill was introduced in the Senate along with 34 co-sponsors, including Senators Tammy Baldwin (D-Wis.), Michael F. Bennet (D-Colo.), Richard Blumenthal (D-Conn.), Cory A. Booker (D-N.J.), Sherrod Brown (D-Ohio), Benjamin L. Cardin (D-Md. ), Robert P. Casey, Jr. (D-Pa.), Tammy Duckworth (D-Ill.), Richard J. Durbin (D-Ill.), Kirsten E. Gillibrand (D-N.Y.), Kamala D. Harris (D-Calif.), Margaret Wood Hassan (D-N.H.), Martin Heinrich (D-N.M.), Mazie K. Hirono (D-Hawaii), Amy Klobuchar (D-Minn.), Patrick J. Leahy (D-Vt.), Joe Manchin III (D-W.Va.), Edward J. Markey (D-Mass. ), Robert Menendez (D-N.J.), Jeff Merkley (D-Ore.), Christopher Murphy (D-Conn.), Gary C. Peters (D-Mich.), Jack Reed (D-R.I.), Bernard Sanders (I-Vt.), Jeanne Shaheen (D-N.H.), Debbie Stabenow (D-Mich.), Tom Udall (D-N.M.), Chris Van Hollen (D-Md. ), Sheldon Whitehouse (D-R.I.), Ron Wyden (D-Ore.), Catherine Cortez Masto (D-Nev.), Maria Cantwell (D-Wash.), Dianne Feinstein (D-Calif.), and Tina Smith (D-Minn.). The bill was introduced in the House of Representatives with 58 co-sponsors, including Representatives Pete Aguilar (CA-31), Suzanne Bonamici (OR-01), Brendan F. Boyle (PA-13), Anthony G. Brown (MD-04), Tony Cardenas (CA-29), Kathy Castor (FL-14), David N. Cicilline (RI-01), Gilbert Ray Cisneros, Jr. (CA-39), Steve Cohen (TN-09), Susan Davis (CA-53), Diana DeGette (CO-01), Rosa DeLauro (CT-03), Debbie Dingell (MI-12), Anna G. Eshoo (CA-18), Abby Finkenauer (IA-01), Bill Foster (IL-11), Vicente Gonzalez (TX-15), Raul M. Grijalva (AZ-03), Jahana Hayes (CT-05), Katie Hill (CA-25), James A. Himes (CT-04), Sheila Jackson Lee (TX-18), Pramila Jayapal (WA-07), William R. Keating (MA-09), Derek Kilmer, (WA-06), John B. Larson (CT-01), Barbara Lee (CA-13), Nita Lowey (NY-17), Ben Ray Lujan (NM-03), Elaine Luria (VA-02), Sean Patrick Maloney (NY-18), Gwen Moore (WI-04), Joe Neguse (CO-02), Donald Norcross (NJ-01), Eleanor Holmes Norton (DC), Ed Perlmutter (CO-07), Dean Phillips (MN-03), Chellie Pingree (ME-01), Jamie Raskin (MD-08), Kathleen M. Rice (NY-04), Gregorio Kilili Camacho Sablan (MP), Linda T. Sanchez (CA-38), Mary Gay Scanlon (PA-05), Jan Shakowsky (IL-09), Kurt Schrader (OR-05), Jose E. Serrano (NY-15), Brad Sherman (CA-30), Adam Smith (WA-09), Jackie Speier (CA-14), Mark Takano (CA-41), Mike Thompson (CA-05), Dina Titus (NV-01), David Trone (MD-06), Peter J. Visclosky (IN-01), Debbie Wasserman Schultz (FL-23), Peter Welch (VT-AL), Susan Wild (PA-07), and Frederica S. Wilson (FL-24).